Google drive's preview feature allows you to get a quick peek of files including documents, photos, videos and pdfs. To preview a file, first select the file by ticking it's checkbox and click on the preview button (eye button) at the top. Next and previous buttons are available on both sides for navigation. 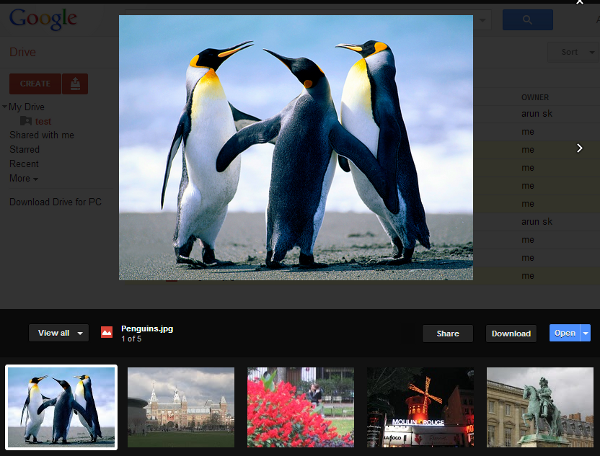 You can also use the "View all" button and scroll through thumbnails of all images currently being previewed. To close a preview, either use the close button at the top right or just click any where on the gray area outside the document preview. TIP1: Google will open all files except Google documents or scripts in the preview pane if you clicking on them.That means if you want to preview an image - just click on it. 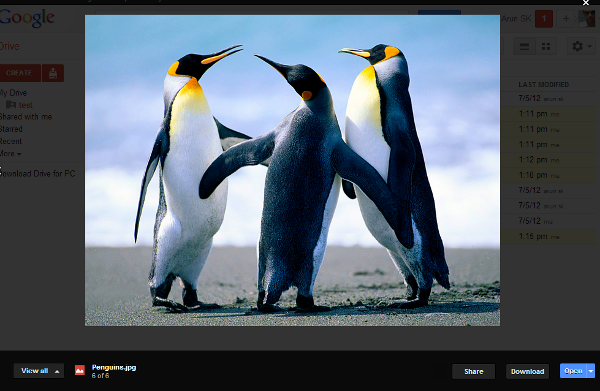 Note that you also have a thumbnail view option at the top to make selections easier. TIP2: If you upload a video and try to see it's preview immediately, Google drive preview will show a "Sorry, we can't display the video at this time." message. This is because, once you upload, Google drive first processes your video similar to Youtube so it can be previewed in various sizes and streamed with minimum bandwidth. Just wait for 5 minutes, refresh (F5) your window and the video preview will be available. TIP3: If you get a "No preview available" message, that means the file type is not supported by Google drive. For a list of file types that Google drive can preview see here. TIP4: If you get a "Your documents are temporarily unavailable" message, that just means that Google drive is doing some internal processing on the file. Just wait for a few seconds and try preview again and it should work. If you choose to preview one file, all the files in the folder gets selected for preview and can be seen one by one using the next and previous buttons. But suppose you want to preview only a few selected files together. One way is to select them one by one and hitting preview button for each. The better way is to select all of the files you want to preview by ticking on their checkboxes and hitting the preview button. When more than one file is selected, Google drive preview will only consider the selected files for preview rather than all the files in the current folder. Backup & Archive Gmail Emails to Google Drive As Pdf. Add Calculator App to Your Windows 8 Metro UI Screen. A complete guide to Google drive preview with tips on common errors and solutions.